The AHDC Shipping department maintains an assortment of supplies for your specimen needs. Click here for a full list of diagnostic supplies and shipping materials to meet your specimen needs. See QMPS Supplies for additional Quality Milk supplies and materials. How long will it take to receive my supplies order? Generally, your order will take up to 24 hours to prepare and depart the AHDC loading dock. All supply orders are shipped UPS ground. Faster service is available for an additional fee. Call our Shipping dept at 607-253-3935 for more information on getting your supplies faster. 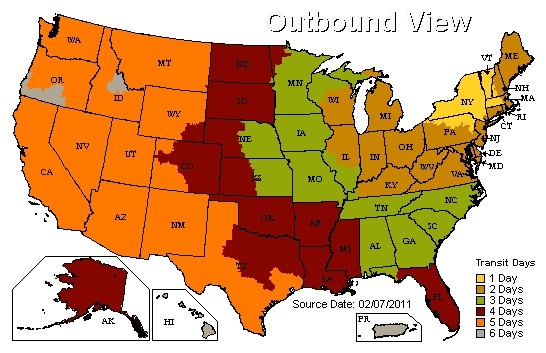 The UPS map below will reflect standard ground transit time. Note: The AHDC is located in the yellow section of the map. How much does it cost to ship my Supply order? Shipping charges are based on the total USD amount of the order placed. * All supply orders are shipped out UPS Ground.